Three generations, two world wars, one family. In the year of 1914, in the canefields of northern New South Wales, the young men couldn't wait to set off for the adventure of war. The women coped as best they could, raised the children, lived in fear of being next to receive an official telegram. They grieved their dead, and came to learn that for returned men there are worse things than death in combat. They bore more children to replace those lost in the First World War, and the sons were just the right age to go off to the second. 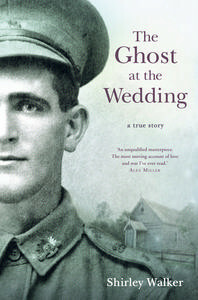 The Ghost at the Wedding is like no other account of war, chronicling events from both sides – the horror of the battlefields and the women who were left at home. Shirley Walker's depictions of those battles – Gallipoli, the Western Front, the Kokoda Track – are grittily accurate, their reverberations haunting. Written with the emotional power of a novel, here is a true story whose sorrow is redeemed by astonishing beauty and strength of spirit. A captivating insight into one family’s history over 3 generations.